This is a copy of a painting in cave 1 at Ajanta. These cave paintings are the oldest surviving examples of painting in India. They date from the 1st century BC to about AD 480 and depict stories from the lives of the Buddha (the Jatakas). 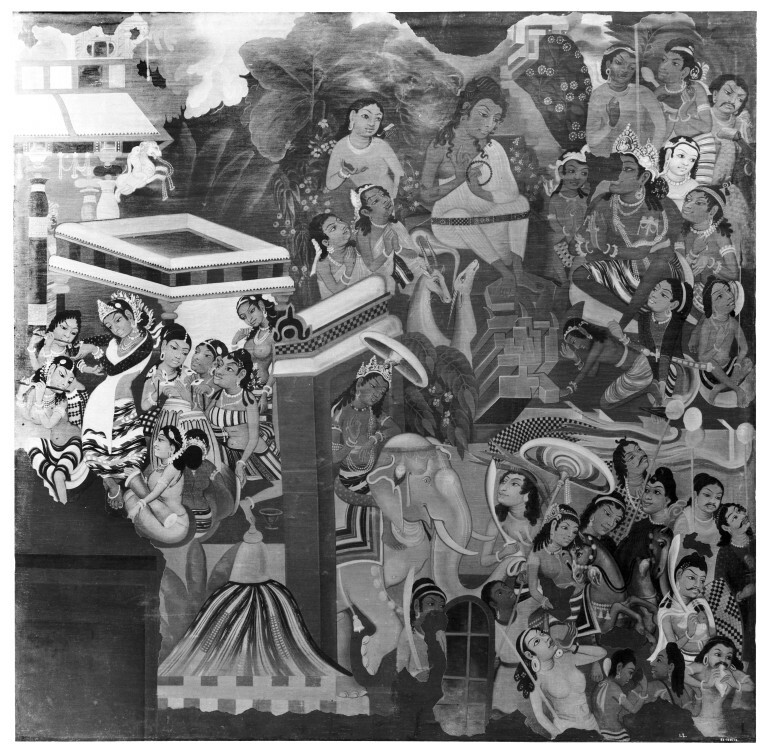 This one depicts scenes from the Janaka Jataka. The cave complex was discovered in 1819 and attempts were made to document the paintings inside them. In 1844 Major Robert Gill was commissioned to make copies. Most of the 30 or so paintings he completed were displayed at the Crystal Palace in Sydenham, south London. Unfortunately they were destroyed in a fire there in 1866. This painting is one of only four surviving examples in the V&A. The right hand edge of this painting follows on from the left hand edge of IS.55-1885. The scenes from IS.55-1885 follow directly on to IS.53-1885. On the left hand side is a covered pavilion under which is a graceful dancer surrounded by musicians. To the right of this group is a gateway through which a raja riding on an elephant is departing. In front of the elephant is a group of attendants, two on horseback, others on foot and some carrying swords. The same raja is depicted in a scene to the top right of the painting which shows him in obeisance to an ascetic who is placed in a rocky setting with plants and deer nearby. In the bottom left hand corner is the outline of a doorway into the monk’s cell and to the right of that is a striped conical object, possibly the top of a tent. 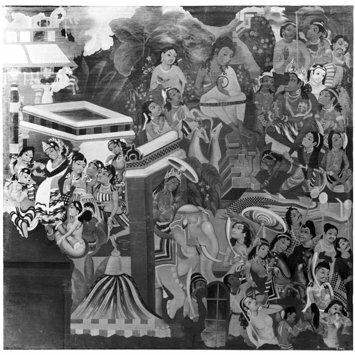 This painting depicts scenes from the Janaka Jataka, the narrative of which continues on from IS.55-1885. I.L. in white on bottom right hand side on front of canvas. Commissioned by the Government of India between 1844-1863 and deposited in the India Museum. Historical significance: The paintings inside the Ajanta caves tell stories fromthe lives of the Buddha. 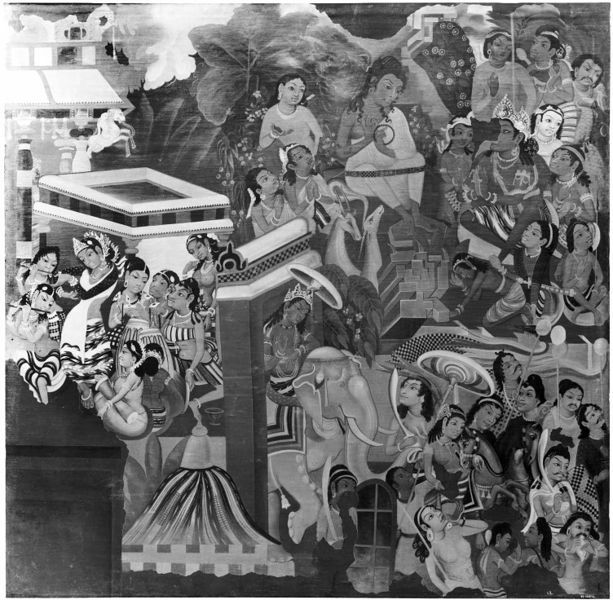 The main part of this painting depicts scenes from the Janaka Jataka. The narratives continues from IS.55-1885. King Janaka of Videha is seen sitting in his palace with his wife. He announces to her that he intends to renounce his worldly life. Scene depicted in the centre of IS.55-1885. In order to persuade him against this course she organises a music and dance performance. Scene depicted in left hand side of IS.53-1885. Despite the pleasure of viewing the dancers, the king confirms his decision to live alone. According to Schlingloff, he is persuaded to do this by the sight of women preparing cotton as the two bangles that one of them is wearing clash together and resound, whereas the single bangle of the other women remains silent. Scene depicted in bottom centre of IS.55-1885. The king renounces his kingdom and rides out through the city gates on his elephant, accompanied by a retinue which includes his son. Scene depicted in the centre of IS.53-1885. The cave paintings of Ajanta are the oldest surviving examples of painting in India. They depict scenes from the lives of the Buddha and date from the 1st century BC to about AD 480. The cave complex was discovered in 1819 and since then attempts have been made to document the paintings inside them. In 1844 Major Robert Gill was commissioned to make copies. Of the 30 or so paintings he completed most were displayed at the Crystal Palace in Sydenham. Unfortunately those that were displayed were destroyed in a fire there in 1866. This painting is one of only 4 surviving examples in the museum collection. Copy of painting in the caves of Ajanta by Robert Gill, oil on canvas, 1856, India. Schlingloff, D, Guide to the Ajanta paintings, Vol. 1, New Delhi, 1999.